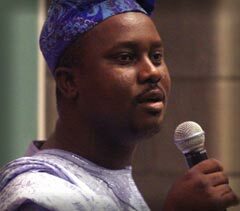 Professor Pius Adesanmi is the author of You’re Not a Country, Africa! I owe the title of this lecture partly to the Nigerian poet, Amatoritsero Ede, who recently “booked” a fellow Nigerian writer for “facing” him in a Facebook spat and, partly, to my favorite palm wine tapper in Isanlu, my hometown in Nigeria. Although Ede coined the brilliant expression, “Face Me, I Book You”, I think the greater debt is owed to my tapper. I call him my tapper extremely cautiously because he also tapped wine for my father for decades, becoming my tapper only after Dad passed on in 2007. My palm wine tapper needs no introduction to you. You know him. He is an eponymous subject, still very much part of whatever is left of the bucolic Africa “of proud warriors in ancestral savannahs” which fired the imagination of David Diop, Léopold Sédar Senghor, and others in the Négritude camp but irritated Wole Soyinka, Es’kia Mpahlele, and other opponents of Négritude’s “poupées noires” version of Africa to no end. You know him. You know him because his craft is ageless and has defied the frenzied and chaotic wind of postmodernity blowing over Africa. Baba Elemu – that’s what we call a palm wine tapper in Yoruba – is still alive and kicking in towns and villages all over West Africa. Firoze Manji of Pambazuka once busted my West African monopolist bubble by telling me that they also know the palm wine tapper in East Africa. You know him. You know him because the fruit of his labour episodically irrigates your tongue whenever summer research takes you to those parts of Africa where he still plies his trade. His black and rusty Raleigh bicycle, the ageless gourds and tired plastic containers attached to the rear end of the bicycle (carrier in Nigeria), all bubbling and foaming in the mouth, and the dark brown belt of reeds that has gathered mileage by taking his ilk up and down the trunk of palm trees since Obatala got drunk in the mythic process of creation, are all iconicities of a certain version of Africa that will just not go away. You know him. In addition to this generic portrait, my own palmwine tapper is always a vital source of reconnection with my roots during summer vacations in my hometown. Connoisseurs of the matter at hand know only too well that nothing beats the early morning harvest, especially if it comes undiluted with water. That is why the palmwine tapper has to beat even the most auroral farmer to the belly of the bush. The palm tree knows how to reward the tapper who sets forth at dawn. Whenever I’m home, the pact between my palmwine tapper and me ensures that he wakes me up around 6 am on his way back from the bush with my own reserved portion of “the usual”. I suspect that one of his kegs was named for me or I was named for it as Achebe was named for Victoria, Queen of England. He filled it faithfully every morning and his “akowe, mo ti gbe de o” (Book man, I’ve brought your wine) was my muezzin’s call to prayer. My mum would grumble that I now wake up to the call of palm wine. Whatever happened to the Pius she raised to wake up to the Angelus and morning mass? I did not hear my tapper’s call to prayer on this particular day in the summer of 2008. The jarring clang of TuFace Idibia’s “African Queen” – I’m sure you all know that song – was what woke me up. One of my nieces in the village had been kind enough to set the said song as my ringtone. Ladies and gentlemen, please sing with me: “You are my African queen/the girl of my dreams/you take me where I’ve never been”. That was Idibia crooning in my cell phone. Who could be calling that early in the morning? I concluded that it must be some silly friend back in Canada or the US who’d forgotten the time difference between Nigeria and North America. I hissed and fumbled for my phone in the greyish darkness of the early morning and the voice that came from the other end made me jump up in bed. That was my palmwine tapper phoning me – wait for this – from the bush! As I later found out when he returned from that morning’s sortie, he was calling me from the neck of one of his trees. He wanted to let me know that delivery would be delayed that morning and I may not get my regular quantity of “the usual”. Funny things had happened to his gourds. I understood. In the village, strange spirits disguised as villagers sometimes climbed trees to help themselves to the fruit of another man’s labour. It was all part of the territory. I told him not to worry. I would accept whatever he was able to supply. Then it hit me like a thunderbolt! The familiar and the strange. The uncanny. Try to imagine an elderly palm wine tapper atop a palm tree in the village, reaching for his pocket to fish out his blackberry in order to discuss the laws of supply and demand with a customer whose father he had also served decades earlier under a totally different economy of meanings and you will understand why that event, in the summer of 2008, marked a turning point in my attempts to fashion new ways of listening to so many new things Africa seems to be saying about her historical quest for agency – a quest that has lasted the better part of the last five centuries . I also began to think seriously about how the new economies of agency emanating from Africa pose serious challenges to the work of the imagination in the postmodern age of social media and immediate communication. In thinking along these lines, I haven’t been too far away from the epistemological challenges which confronted another thinker, another place, another time. I am talking of Walter Benjamin’s attempt to grapple with the rise of the image – film and photography – and its impact on the work of art in his famous essay, “The Work of Art in the Age of Mechanical Reproduction”. The Age of Mechanical Reproduction? That’s so dinosaur now! Perhaps you will agree with me that until a blackberry joined the arsenal of tools and implements that my palm wine tapper took atop his trees every morning in Isanlu, he belonged in a habitus of tradition governed by those mytho-ritualisms of existence which has led to tensions in the arena of historical discourses and counter-discourses about Africa’s agency. My palm wine tapper sans his blackberry comes from the world we have come to associate with Chinua Achebe’s Things Fall Apart – especially the world as the people of Umuofia knew it before Obierika’s famous metaphor of the rope and the knife – or Birago Diop’s Breath – where we must “listen to things more often than beings” in order to hear the voice of fire, water, wind, and bush. To see the real Africa. The story of agency as it relates historically to Africa is easy to narrate from this point. Europe encountered this Africa of “mute ancestral spirits” and “hidden hearts”, called her horrible Conradianly dark names, and proceeded to deny her agency through a series of historical violations and epistemic violence, which bear no rehashing here. As disparate and contested as they have been, Africa’s and her diaspora’s epistemological responses to these violations have been fundamentally about the recovery of agency. We named these responses Négritude, pan-Africanism, cultural nationalism, decolonization, just to mention those. In the process of articulating these robust responses, Wole Soyinka and Eskia Mpahlele may have gone after Senghor; Ali Mazrui and the Bolekaja troika may have gone after Wole Soyinka who, in turn, went after some of them as neo-Tarzanists; Mongo Beti may have gone after Camara Laye for publication of work not sufficiently anti-colonialist; and Obi Wali may have gone after English-language dead-enders, opening the door for Ngugi wa Thiong’o’s decades-long crusade against Europhonists, I don’t think that anybody would quarrel with my submission that these tensions and disagreements are more or less what the Yoruba would call the multiple roads leading to the same market. That market is the recovery of the self, recovery of agency. In the stretch of essays and books from “Dimensions of African Discourse” to The African Imagination and, lately, The Négritude Moment, Abiola Irele has done remarkable work mapping the evolution of and the tensions inherent in Africa’s counterdiscourses of self-recovery. Writing from a different philosophical perspective in the essay, “African Modes of Self Writing”, Achille Mbembe takes a somewhat dismissive tack absent from Irele’s work but nonetheless identifies three historical events – slavery, colonization, apartheid – as fundamental to the two currents of discourses and processes of self-recovery that he identifies as central to the question of agency: Afro-radicalism and nativism. What is interesting for me – and I believe for numerous readers, critics, and followers of Mbembe – are the weaknesses he ascribes to both traditions of discourse in his attempts to problematize them. To Afro-radicalism, he ascribes a “baggage of instrumentalism and political opportunism” and to nativism he ascribes a “burden of the metaphysics of difference”. I wonder what my brother, Adeleke Adeeko, thinks of that particular critique nativism but I digress. My reading of Mbembe’s essay has shifted over the years from a fundamental disagreement with his characterization and insufficient contextualization of Afro-radicalism and nativism to what I am beginning to think are gaps and silences in his critique of the African imagination. These gaps and silences pertain to the very nature of Africa’s agency even within the ideological politics and the economies of self-recovery in the African text. For we must ask: what sort of agency does Africa really acquire in Négritude and cultural nationalism? I am talking about the version of Africa which Chinua Achebe, Senghor, Birago Diop, Mongo Beti, Ferdinand Oyono, and Abioseh Nicol rescued from Europe’s post-Enlightenment philosophers and colonialist writers. Which agency does Africa acquire in the texts of these shons of the shoil? Which agency does my palm wine tapper acquire as he moved from Conrad to Achebe? I think his transition is a move from being silent and unspeaking in one textual world to being rescued but spoken for in another textual world. One world gives him to us in body parts, capable only of dialects or incomprehensive babble, tapping a horrible alcoholic brew consumed by lazy natives in irrational quantities, an activity he gets to perform only if he escapes poisonous snakes, lions, and hyenas. Another textual approach restores the cosmic harmony of his world, the ancestral dignity of his work, and treats his product, palm wine, as worthy of the elevated cultural registers and aesthetic apprehension that Africa’s violators would normally reserve for merlot, cabernet sauvignon, or pinot noir. The flora, fauna, and seasons of his world, especially the palm tree, also become subjects of elevated aesthetic treatment. If, as Adam Gopnik, the Canadian essayist for The New Yorker, assures us in his Massey lectures, the Romantic imagination elevated winter and ice to art and aesthetics, Achebe and his contemporaries would do much more for the world of the palm wine tapper in their attempt to fully restore his agency. Don’t forget that harmattan and even the white froth and foam of palm wine became worthy elements of metaphorical constructions. But the tapper is still spoken for in and by these texts. In at least one instance, he is upbraided for killing trees in his youthful exuberance. I am thinking here of a different version of the problematic that Linda Alcoff evinces in her well-known essay, “The Problem of Speaking for Others”. Race and gender are weighty dimensions in Alcoff’s treatise on the pitfalls of speaking for the native, the oppressed, or the gendered subject. What happens if Africa is the subject that is spoken for or represented, albeit in the ideological resistance mode of Afro-radicalism and nativism, by the privileged African intellectual, especially the writer? African feminism’s critique of Négritude’s treatment of African woman and African womanhood provides part of the answer. We must all remember that Mariama Ba and her contempories, writers and critics alike, got tired of Négritude’s constant conflation of Mother Africa and the mothers of Africa. Yet, in the beautiful and memorable lines such as “Négresse, ma chaude rumeur de l’Afrique” and “Femme noire, femme nue”, the Négritude poet actually believed that he was conferring agency on his subject. I think my problem as an intellectual arose that morning in Isanlu when a momentary cognitive scission occurred and denied me the ability to “confer authority” on the intrusion of a symbolic element such as a blackberry into the imaginary of palmwine as I used to know it. It was immediately obvious to me that what was happening was beyond what could be explained by the usual recourse to the tradition-modernity binary, with the attendant intimations of how Africa negotiates modernity by gradually appropriating, domesticating, or integrating it within her own orders of experience. From the top of his palm tree, my palmwine tapper was articulating his own agency and self-representing in ways that are miles ahead of the imaginaries which underwrite my work as a writer and critic. That, I posit, is the problem of African art in the current age of social media and MAC, my acronym for mutually assured communication. The fact that he phoned me from the top of a tree in the bush rattled and unsettled me. What if, God forbid, my Baba Elemu had also recorded videos of himself at work and posted it on youtube as these new possibilities of agency now afford him? What if he tweets his conversation with me from the top of that tree? What if he makes a photo of himself at work the cover of a Facebook page dedicated to tapping? What if… questions, questions, questions. In a way, I think the writers of Négritude and cultural nationalism, escaped these dilemmas not because they shared coevality – or restored it where it was denied – with the palm wine tapper but because they operated as artists in the age of mechanical reproduction which, as revolutionary as it was, still allowed the possibility of a certain “inert” version of Africa that could be “rescued”, “re-represented”, and “spoken for” in their texts. My second submission is that this inert version of Africa, on behalf of whom Afro-radical and nativist discourses and praxes were articulated, now speaks for itself in ways that perpetually confound art and the imagination. Coping with an Africa which no longer needs your powers of metaphorical mediation to articulate novel forms of agency which have the added power of immediate global circulation is one of the most formidable dilemmas facing the generation of African writers, artists, and intellectuals to which I belong. Chris Dunton and I have edited some special issues of journals in which we described these new writers, in the case of Nigeria, as the third generation. That description of convenience has been vigorously challenged. My good friend, Abdourahman Ali Waberi, also a keynote speaker in this conference, has famously described that generation of writers as “les enfants de la postcolonie” in the case of our Francophone counterparts. Jacques Chevrier at some point was moving the idea of “migritude writers” but I haven’t followed the critical fortunes of that concept. Thanks mostly to the Nigerian members of this generation who have been winning bucket loads of international literary prizes – I am almost blushing with nationalistic pride here – the work produced by the children of the postcolony is now globally known and is the subject of numerous panels in conferences such as the ALA. I am thinking of Helon Habila, EC Osondu, and my maternal cousin, Segun Afolabi, who have all won the Caine Prize. There is Chimamanda Adichie and, also, Tricia Adaobi Nwaubani, who did well in the Commowealth competitions. There is Teju Cole, who recently won the Hemingway Prize here in the US. Oprah made the fame of Uwem Akpan and hefty manuscript cheque confirmed Helen Oyeyemi’s arrival on the global literary scene. To these we must add other bright representations of new African writing, especially the novel, such as Binyavanga Wainaina, Monica Arac de Nyeko, Petina Gappah, Leonora Miano, Alain Mabanckou, Abdourahman Waberi, Dinaw Mengestu, Hisham Matar, and Ellen Banda-Aaku, my co-winner of the Penguin Prize for African Writing. So, we have a cast of writers and a new writing that now whets critical appetites in international conferences. My concern is whether we are paying sufficient attention to the extraordinary dilemmas that these writers face in their attempts to write a continent which now possesses the ability to self-write, self-inscribe, and self-globalize even before the first sentence of your novel, poem, or short story takes shape in your head. How do you write a continent which no longer lies inert to be rescued from misrepresentation? I saw hundreds of responses and counter-discourses from the African street to the Kony 2012 video before Teju Cole and Mahmoud Mamdani offered their famous responses. In Twitter and Facebook years, the writer and the scholar were light years behind the African street. To bring this dilemma back to my point of departure, how should this generation write my blackberry-wielding, self-inscribing palmwine tapper? Reduce palmwine and blackberries to conflicting metaphors and inscribe that conflict in flowery prose? That would be too simplistic. Besides, there is a second problem. Those who wrote Africa’s agency in the age of mechanical reproduction never really had to deal with new forms of art that competed with and challenged the ontology of their respective mediums of expression. The novel, the short story, the poem, the play, and the painting didn’t have to worry too much about other forms of generic expression emerging at once as evidence of Africa’s new ability to self-represent and also as contending and competing forms of art. This lack of competition, if you ask me, partly accounts for why the scribal form of the African imagination, enjoyed an imperializing prestige over oral forms much to the consternation of colleagues like Karin Barber and Thomas Hale. Tricia Nwaubani’s excellent novel, I do not Come to you by Chance, sadly, does not enjoy the luxury of not worrying about competition for its ontology as a form of art which seeks to represent a particular reality of post-SAP Nigeria in terms of its local and international dimensions. What do you do if you are writing a novel about what, for want of a better description, we must call Nigeria’s 419 letters and the imaginaries that have now come to be associated with it, only to discover that those letters themselves are now being discoursed and critiqued as art forms on their own terms? Where the 419 letter now stakes a vigorous claim to an ontological identity as art, does a novel which ventures into its territory even merit the description of simulacrum? Which is the art representing what? It is almost now possible to claim that the 419 letter waiting in your mailbox as you listen to my lecture here is art representing the reality that is Nwaubani’s novel. If your head is not spinning yet, please remember that some actors in Africanist scholarship here in North America have been very active in making a case for 419 emails as an art form worthy of critical reflection. I have received at least one solicitation in the past to help evaluate submissions to a planned special issue of a scholarly journal on 419 letters as a literary genre. As I speak, the same argument is being made for the literary quality and generic integrity of tweets. In Canada, where I am based, the literary establishment seems to have made up its mind that the tweet is a literary work. Now, that’s tricky because it makes every tweeter a potential writer just as a collection of somebody’s Facebook status updates or 419 letters could give us a Nobel Prize for Literature down the road. If you look at the website of Canada Writes where the CBC organizes the prestigious CBC Literary Prizes, you’ll be able to assess the considerable energy devoted to tweets and tweet challenges. Tweet is literature as far as Canada Writes is concerned. The Nigerian writer, fiery critic, columnist, and cultural commentator, Ikhide Ikheloa, has been screaming himself hoarse about the need for African writing to face these new realities. Like Obi Wali, decades ago, Mr Ikheloa has been making very weighty pronouncements on the future of African writing. And he is arguing, among many pro-social media arguments, that tweets, Facebook updates, and the associated genres of the social media age, would leave African writers behind if we don’t come up with imaginative ways to engage the forms of continental agency which they throw up. The way he sees it, social media is a significant part of the future of African writing and he has been warning that writers in my generation, especially those who remain social media stone agers, are in danger of extinction. I take Mr. Ikhide’s work extremely seriously and follow him religiously online. You should google him, follow him on twitter, and add his blog to your daily reading. When he is not upbraiding African writers in the new generation for not taking the full measure of the possibilities of the social media revolution for our work, he is making very valid points in terms of the contributions of social media to even our own agency as writers. Let me explain my understanding of Ikhide’s position. Errors of interpretation would be mine. I think the debate about which audience the African writer ultimately writes for is further complicated for my generation by the mediators who stand between our work and our audiences. A measure of that is how much of Africa we still literally translate or italicize in the actual process of writing. Go to any Nigerian novel and see what happens with registers and diction depicting the actualities of youth experience, counterculture, and postmodern citiness for instance. “Bladdered, legless, preloaded – all registers of English drunkenness. Would a British writer in my generation Italicize these experiences specific to his own people in a creative work? You guess is as good as mine. “Stop Italicizing Africa!” Ikhide screams at writers in my generation all the time on Facebook. “Stop writing Africa for your literary agents, publishers, editors, marketers, and Western liberals”, Ikhide screams. Perhaps Ikhide already suspects that there is a reason why Salman Rushdie and Paulo Coelho – more international writers are following their example – have quietly migrated a great deal of their art, celebrity, and mystique to Facebook. “If your handlers insist on an Italicized Africa, take your agency to social media and engage the world freely”, Ikhide screams at African writers. I hope I am not the only one who takes Ikhide extremely seriously.